On Tuesday, Alabama's sophomore defensive back Jonathan Cook, was dismissed over the phone by Nick Saban. 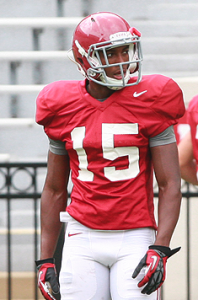 A statement from the University of Alabama said Cook was "no longer a member of the team." As reported by Al.com, Cook's mother said that that her son "just had some issues outside of the field" but it was not legal issues. She also went on to say that the dismissal was "somewhat surprising." Cook will try to get on with another football team as close to home as possible, with UAB being a possibility. Cook was buried deep in the defensive backfield rotation. It is not known what triggered the release, but it is not unusual to see a player or two released in the summer due to conduct, grades or medical issues.